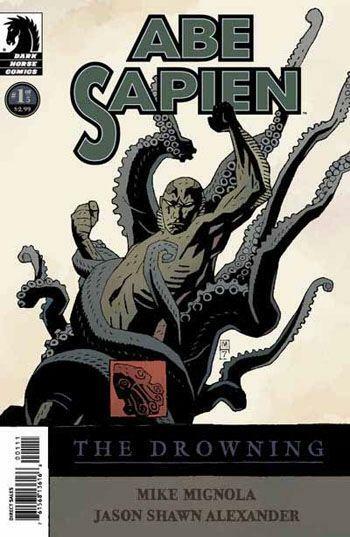 Mike Mignola hands the pencil over to Jason Alexander (not George from Seinfeld) and picks up the pen to script agent Abe Sapien's first self titled mini series. Mignola often writes his Hell Boy universe stories, but he also draws them. He has established an art style which is copied over and over in art schools and on sketch pads all over the world. His Hell Boy character and universe have become so popular that the style of art and the HB stories have become synonymous with each other. Mignola brand art is how we view HB characters. In other comic books, characters such as Spider-Man are not defined to the comic community by one consensus artist; rather, there are different strokes (of the pencil) for different folks. In Abe Sapien: The Drowning #1, Jason Alexander's art is a bit different than Mignola's but still captures the HB style. I wonder if Alexander's style is truly the same or if he altered it to fit the tone of the characters and story. If Alexander's style is his own in Abe Sapien: The Drowning #1 then does that mean his style was a copycat of Mignola's or influenced by Miggy's? Either way, the art feels like that of the other HB books. Abe Sapien: The Drowning #1 gives Abe his first solo mission, or at least a mission without Hell Boy around, in which Abe must find a valuable artifact. He must find a dagger which was made for the soul purpose of killing demons. You know...that ol' chestnut. The first issue simply sets up the legend of the dagger and some of the players whom will be involved in Abe's adventure. If you like Abe Sapien as a character you will have to wait till the next issue to get your fill. For a book titled by his name, Abe isn't in this issue very much. Overall, if you enjoy the HB universe this comic of the day is for you. But if you are a casual HB fan, you may want to skip this mini series and issue. A HB universe story without Hell Boy just isn't as satisfying as a tale with the red titan. Alexander's art in this book is awesome, and although it is different, it still gives the book a feeling that Mignola and Hellboy fans can appreciate. As a Hellboy fan, I gotta say that I loved this.